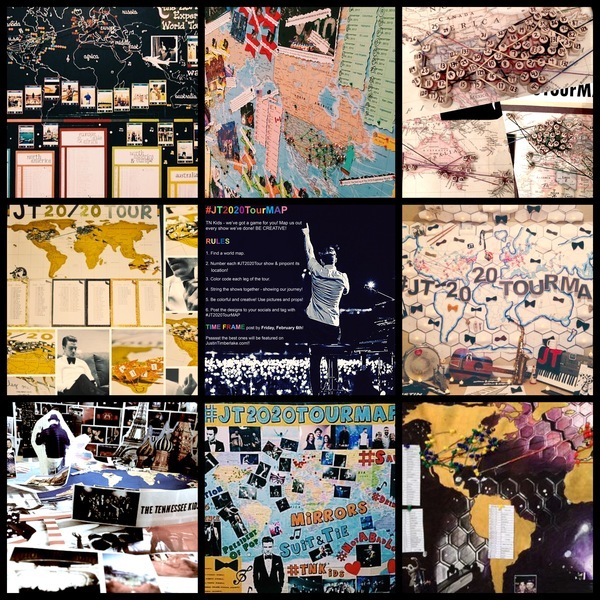 TN Kids - you blew us away with your #JT2020TourMaps! The turnout was surreal! Each map is so unique and creative. We were so impressed at the time the TN Kids Family put in to commemorate the experience. We have collected our top 10 favorites, but it was so hard to choose that we decided to include some additional entries as well! A BIG thank you to everyone who particpated! He painted the stage backdrop and map! And now, in no particular order, here are some more of our favorite entries. You all did a great job! That was fun! Give us more projects! all the maps very beautiful you did a great job guys i proud to see our #JTFAM getting bigger and beautiful so much experience we have in our family and we stay together forever every #TNKID stand up for another tnkid who need help or need to getting better i love you all tnkids i"m very happy that i"m inside in this family i love you guys so much!!!!!!!!!!!!!! My map is #6 thank you sooooo much! I can't believe it's up there. All of these maps are so creative and I cannot wait till another challenge. Today's news was the best news of my life. I screamed at work and was all giddy. Ahhhhh. Thank you sooooo sooooo much! Wow, Good Job Guy's. They're all Beautiful. Really like the Gold one, and @shawnacontent's.... There's Something about that one that catches my eye, I'm on a mission to see if those picture's next to it were hand painted too. Amazing!! This was so much fun! It gave me something to do post-tour, so THANK YOU! ???? So many great entries. Thank you for choosing my map as #2! Wow!! They all look wonderful, upset that I didn't have the time to create one due to school. But I absolutely love them all and I did do the TN Kid of the month entry!! Awesome job everyone!! My JT2020TourMap is #7! Thank you so much!! You guys are amazinggggg!! !